Wins Produced comes back better and stronger! Editor’s Note (i.e. Dre): The following is from Dave Berri, who is now too lazy to post his own stuff. Find the new Wins Produced numbers at Wins Produced, which you’ll notice is on the navigation bar right above you! 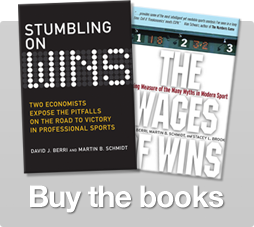 Wins Produced was introduced and explained (not “more or less” explained, but explained in detail in the text and many tedious little end notes) in The Wages of Wins in 2006. It was then discussed (with more math) in an article published in 2008, as well as in Stumbling on Wins (and in other places as well). Both books argued that inefficient scorers in the NBA are overvalued and players that help in ways other than scoring are under-valued. In other words, many players people think are great (or not great) are really not helping (or really are helping quite a bit). The “proof” some people constructed focused on the value of rebounds. Because Wins Produced argues that non-scorers who grab many rebounds are quite valuable – and conventional wisdom argues that non-scorers are simply not that valuable – it must be the case that Wins Produced overvalues rebounds. although diminishing returns – as detailed in Stumbling on Wins — certainly exists for defensive rebounds (but not for offensive rebounds), the size of the effect is “small”. to illustrate, when the impact of diminishing returns with respect to defensive rebounds is accounted for, the ranking of the players doesn’t seem to change much (a point made on the FAQ page). As a consequence, Wins Produced has historically ignored this issue. As the lockout dragged on and on, though, I began to think that maybe it might be better to just incorporate this effect into the measure we post at the WoW Journal. After all, the effect has been measured and it can be included. So why not just make the adjustment and therefore remove the argument “Wins Produced overvalues rebounds” from the discussion. So that is what I have done. The specific calculations – which are somewhat more complicated than what was posted before — are detailed at the new “Calculating Wins Produced” website. In addition, the measurements from 1999-00 to 2010-11 have also been posted. Again, the results are quite similar. There is a 0.98 correlation between Wins Produced as it was calculated before and the new measure that adjusts for what we see with respect to defensive rebounds. In other words, the players who ranked towards the top of the league before still rank towards the top now. And the same story is seen for the players ranked at the bottom. To illustrated, here are the top 25 players once we adjust for the impact of defensive rebounds. Previously the top player according to Wins Produced was Kevin Love. Once we consider the defensive rebounds we estimate Love took from his teammates, Love is now ranked 3rd in the NBA. Again, the two evaluations have a 0.98 correlation. So although there is indeed a difference in the rankings, the difference isn’t very large. Once this adjustment is made, though, we do need a new Win Score. Previously each defensive rebound had the same value as a point, steal, offensive rebound, etc… . Because we are taking into account how a player will take some defensive rebounds from teammates, the value of a defensive rebound will now be lower. To ascertain how much lower, a model was estimated where a player’s WP48 was regressed on the following per 48 minute statistics (adjusted for position played): Points, Offensive Rebounds, Defensive Rebounds, Steals, Blocked Shots, Assists, Turnovers, Personal Fouls, Field Goal Attempts, and Free Throw Attempts. From this regression we see that 98% of the variation in WP48 was explained by these statistics. ** Furthermore, the estimated weights yield the following Win Score model. Calculate Win Score per 48 minutes for the player. Subtract the position average noted above and add back in 5.729 (the overall average). This gives you Relative Win Score per 48 minutes. Of course, these steps aren’t necessary if you make it a point to keep visiting the Wages of Wins Journal. Once the season starts we plan to have continuously updated values of Wins Produced and WP48 for each player. * – One should note that the argument that conventional wisdom in the NBA is incorrect is not unique to Wins Produced. As I argued four years ago, Win Shares and Adjusted Plus-Minus also argue that some scorers are overrated. Not sure I recall anyone being that troubled by this aspect of Win Shares and Adjusted Plus-Minus. One suspects that this is because the on-line stats community doesn’t devote much effort critiquing the models generated by members of the on-line stats community. ** – Using data from 2009-10, Win Shares per 48 minute was regressed on per minute values of Points, Offensive Rebounds, Defensive Rebounds, Steals, Blocked Shots, Assists, Turnovers, Personal Fouls, Field Goal Attempts, and Free Throw Attempts. This regression revealed that 86% of the variation in Win Shares per 48 minutes was explained by the player statistics. That tells us that Win Shares has a much larger adjustment for team statistics. Again, not sure I have ever seen anyone troubled by this feature of Win Shares. Again, one suspects that this is because the on-line stats community doesn’t devote much effort critiquing the models generated by members of the on-line stats community. 29 Responses to "Wins Produced comes back better and stronger!" Who changes the most in the all time rankings? Can someone (Arturo?) post the updated top 100 all time wins produced chart? Thank you, thank you, thank you Dave! Great news. I really appreciate the effort, and I find this updated version substantially improved. The acknowledgement that the system could be improved is worthwhile. While there is high correlation between the two efforts (0.98), there are significant and noticeable player ranking differences. Personally, I suspect that if you had done this right away much of the ‘controversy’ over your system wouldn’t have occurred. (I recall many suggestions of 0.5 for DR weighting in Win Score) Again, thanks for this effort. This is great news. I’ve been doing the same thing in my own Win Score calculations to reflect some of the conversations we’ve had in recent years on the subject. I’m glad to see this! It needed to be done. Good job, Dave. Do you have the full, classic numbers anywhere? Would be interesting to evaluate the changes. I would suggest an improvement, for the calculation of the shooting efficiency. I predict, that there is a correlation between the seconds left on the shoot clock and the shooting efficiency. If seconds left on the shot clock or to the end of the quarter (whichever is smaller) are available for each shot, they should be included in the calculation of the shooting efficiency. Doing so would give players who take more or less buzzer beater shots no unfair disadvantage / advantage. Is the -0.07898 + 0.031888 the same for every year, or is this based on some yearly average thing? For example, I found the WS48 avgs of the league and PG’s in 2006-07, and in my calculations Baron Davis got a .189 WP48. But in your Wins Produced 2007 page, he has a .162 WP48. What am I doing wrong? 1) For in-between position players (i.e. Bosh splitting time between PF and C this upcoming year), how would one calculate the position adjustments for WS/48? 2) How can one calculate WP through Win Score for incoming rookie players who project to make an impact on their respective teams (i.e. Anthony Davis, MKG, Lillard, etc. )?